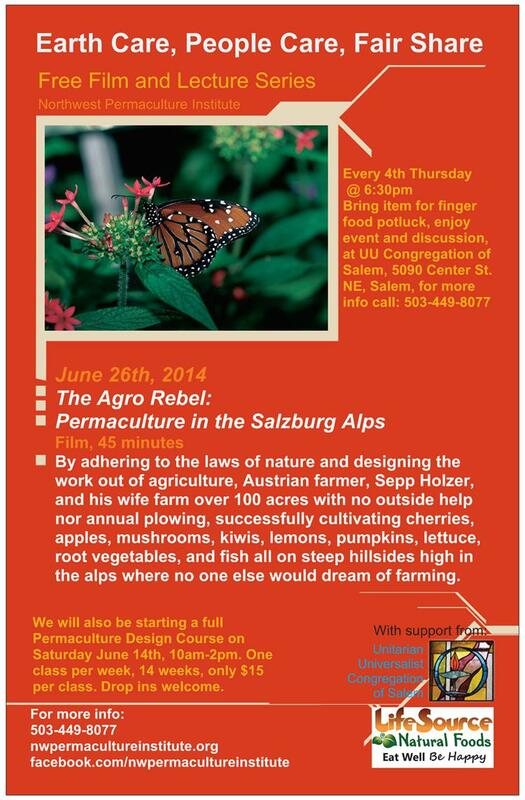 Free Film Event, The Agro Rebel: Permaculture in the Salzburg Alps, June 26th! 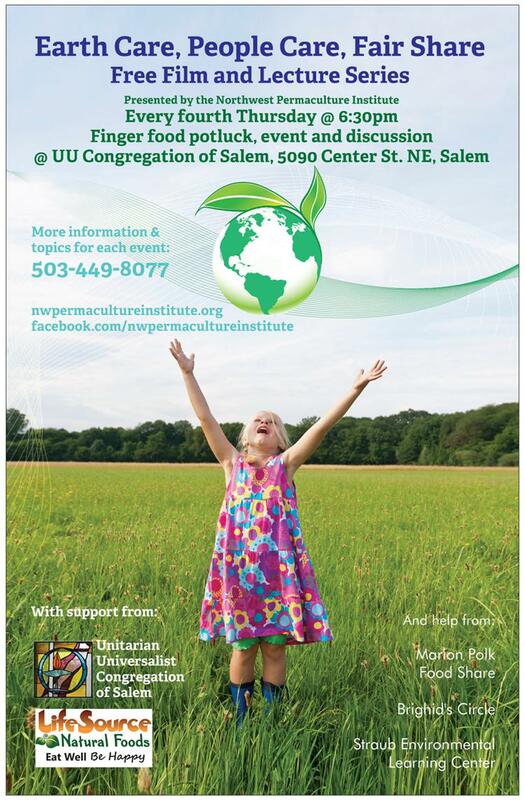 Special Thanks to the Unitarian Universalist Congregation of Salem for the use of the beautiful space, and to Life Source Natural Foods for the potluck beverages. 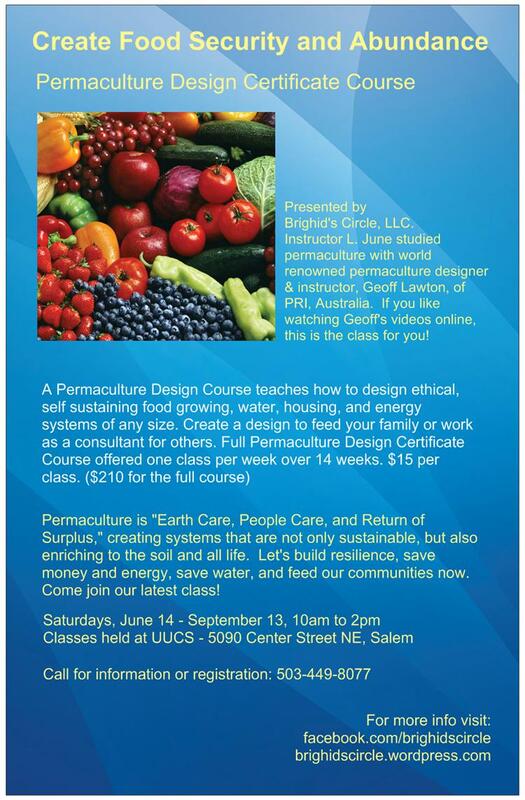 Additional thanks to Marion Polk Food Share and the Straub Environmental Learning Center for helping to promote our events. Categories: Uncategorized | Tags: abundance, aquaculture, bees, chickens, class, companion planting, compost, compost tea, course, dams, design, ducks, earth, earth care, energy saving, ethics, fair share, farm, farmer, fertilizer, fish, food, food securtity, fruit, fungi, garden, gardener, goats, nature, orchard, oregon, organic, people care, permaculture, pigs, ponds, rabbits, rain, recycle, renewable, return of surplus, salem, Sepp Holzer, sheep, sustainable, swales, trees, vegetables, water, water saving, weeds, wildlife, worm bed, worms | Permalink. Categories: Uncategorized | Tags: agriculture, chickens, compost, compost tea, culture, dams, design, ducks, earth, ecology, energy, energy saving, ethics, farmer, film, food, fruit, gardening, goats, homesteading, local, nature, oregon, organic, perennials, permaculture, pigs, rabbits, rain water, salem, sheep, sustainability, swales, vegetables, victory garden, water, willamette valley, worm beds | Permalink. Categories: Uncategorized | Tags: agriculture, chickens, compost, compost tea, culture, dams, ducks, earth, ecology, energy saving, ethics, farmer, film, food, gardening, goats, homesteading, local, nature, oregon, organic, perennials, permaculture, pigs, rabbits, rain water, salem, sheep, sustainability, swales, victory garden, willamette valley, worm beds | Permalink. Categories: Uncategorized | Tags: agriculture, chickens, class, compost, compost tea, course, culture, dams, design, ducks, earth, ecology, energy, energy saving, ethics, farmer, food, fruit, gardening, goats, local, nature, oregon, organic, perennials, permaculture, pigs, rabbits, rain water, salem, sheep, sustainability, swales, vegetables, victory garden, water, willamette valley, worm beds | Permalink.